George H.W. Bush was laid to rest Wednesday alongside his wife Barbara and daughter Robin. Their 73 years of marriage saw everything from the Oval Office to near-death experiences in World War II to the birth of six children, 17 grandchildren and eight great-grandchildren. 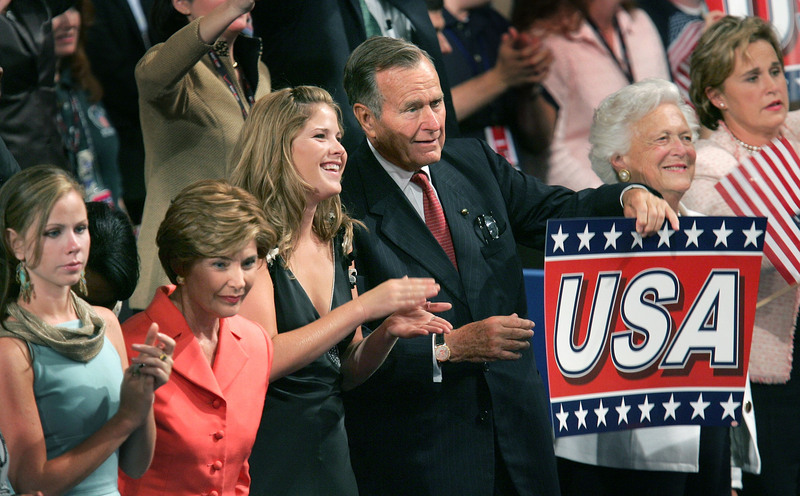 Beginning even before Bush himself, a political dynasty has grown with the Bush name. George Herbert Walker Bush was 17-years-old when he met his wife, Barbara Pierce, at a Christmas dance in Greenwich, Connecticut. Barbara was 16, wearing a red and green dress, when she was introduced to her future husband of 73 years. Barbara passed in April of 2018, and George was laid to rest Thursday alongside her. The pair became the longest married presidential couple to date, and in those years they built a political dynasty of a family that continues to influence the United States and the world today. The Bushes brought six children into the world, who then had 17 grandchildren, who then had their eight great-grandchildren. Many in the Bush family tree followed George’s footsteps into politics, with one serving as Texas Land Commissioner, another governor of Florida and one even as president. George himself was the son of a senator, Prescott Bush of Connecticut. 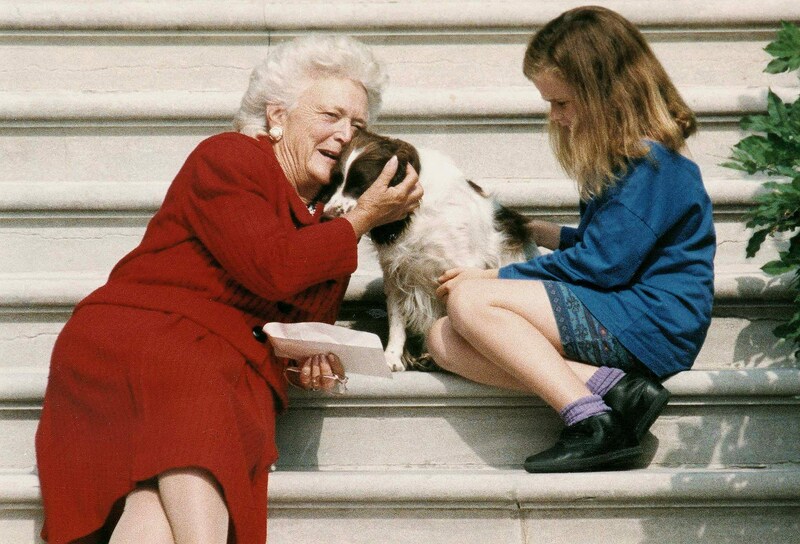 Barbara would eventually drop out of college at the age of 19 to be closer to George, a decision she rarely regretted but had to answer for to critics when she eventually became first lady. 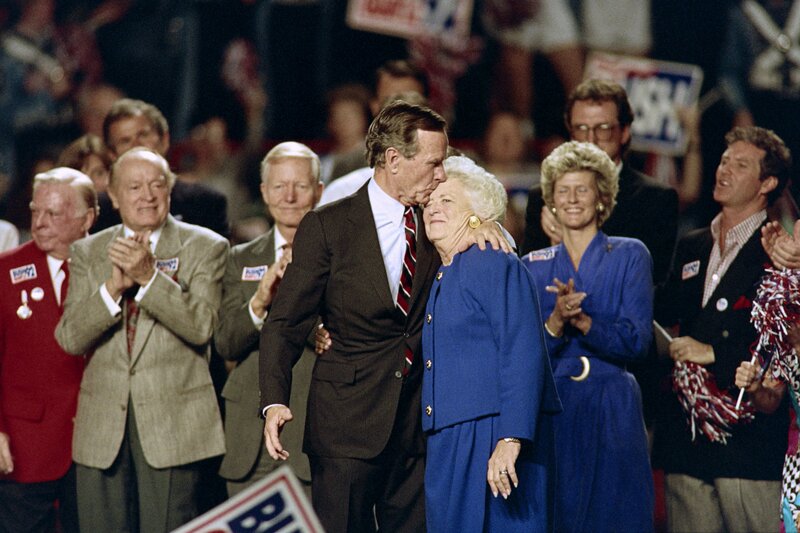 US President George Bush kisses his wife Barbara at the end of a rally held at the Astro Arena on November 2, 1992 on the eve of the 1992 presidential election. President Bush trails Democratic candidate Bill Clinton in pre-election polls. AFP PHOTO EUGENE GARCIA. One of the many letters Barbara and George would send each other while George was stationed overseas serving in the Navy in World War II appears to sum up the couple’s love. The future president and first lady would go on to have six children: George, Robin, Jeb, Neil, Marvin and Dorothy. The couple’s eldest son is George Walker Bush, a two-term governor of Texas and then a two-term president of the United States. Robin, George and Barbara’s first daughter, died at the age of three from leukemia. Next in the political dynasty is John Ellis Bush, or Jeb, who served as the governor of Florida for eight years and also took a swing at the presidency in 2016. Neil and Marvin turned into successful businessmen and investors, and Dorothy became an author and philanthropist. The five living children gave George and Barbara 17 grandchildren, who like their parents and grandparents, forged successful paths in politics, business and philanthropy. 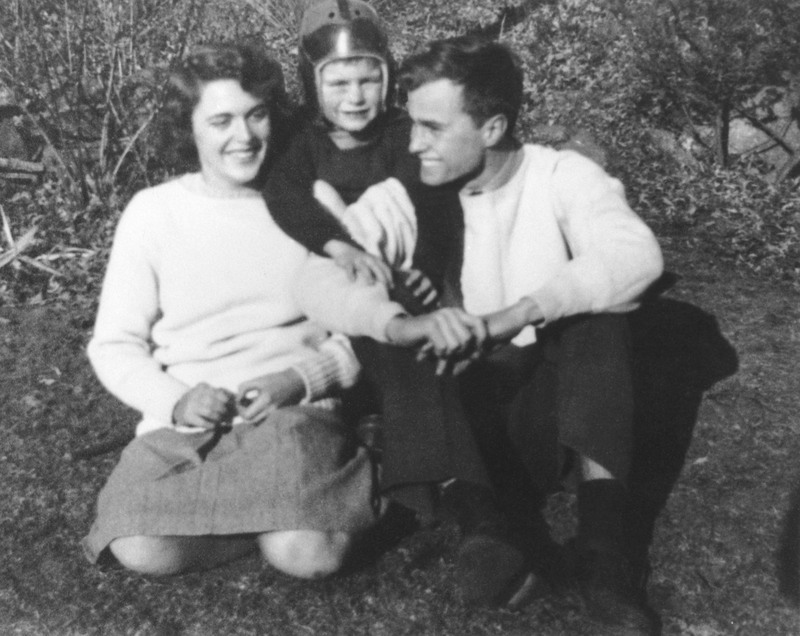 George Herbert Walker Bush (R) poses with his wife Barbara and his brother Bucky in the 1940s. AFP PHOTO/WHITE HOUSE. 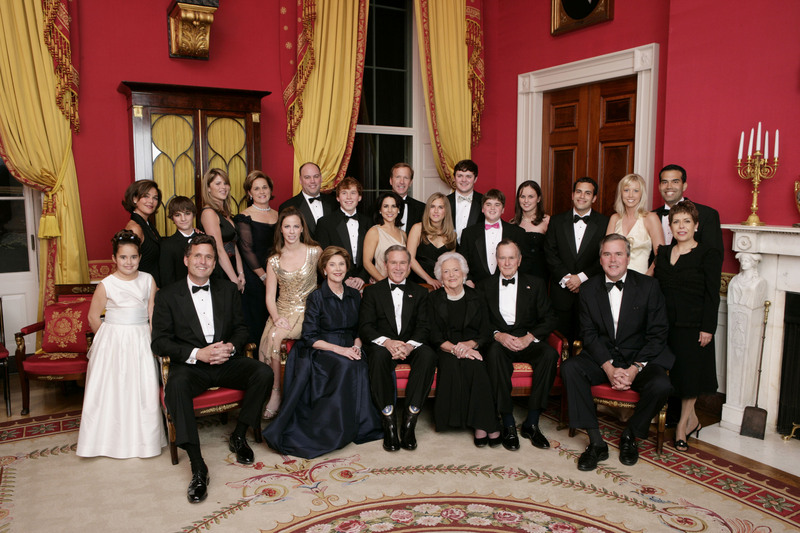 George W. Bush married Laura Lane Welch and the two have twin daughters, Barbara and Jenna. Barbara, the granddaughter, is a co-founder and board chair of the non-profit Global Health Corps and married screenwriter Craig Coyne in 2018. Jenna married businessman Henry Chase Hager in 2008 and is a mother of two. She is a journalist, television personality and teacher. Jeb met his future wife, Columba Garnica Gallo, in Mexico in 1970 while he was teaching English for a foreign exchange program. The two have three kids: George Prescott, Noelle Lucila and Jeb Jr.
George Prescott Bush followed his family’s political lead and was elected Texas Land Commissioner in 2014. George and Barbara’s third son, Neil, is a Texas businessman with three kids of his own, including Lauren Bush, who is married to the son of multi-billion dollar fashion designer Ralph Lauren. The Bush’s fourth and final son Marvin, is also a successful businessman with two kids. The only living daughter of George and Barbara is Dorothy Bush Koch, an author and philanthropist with four kids from two marriages. She is married to Robert Koch, a former aide to a House Majority Leader Richard Gephardt. George and Barbara and their daughter Robin now lay alongside each other at the George Bush Presidential Library in College Station, Texas.